Howdy! My name is Rhonda and welcome to my virtual “front porch”! This is where you will find me coming out from the busyness of life, drying my hands off on my virtual “apron” and sitting down to rest a spell with you, my friends. If you are anything like me, curious, or some may call it a bit “nosy” 😉 then this “about me” page is for you. When I come across something someone is doing that is new or interest me, I want to know, “Who is this person and what on earth is this about?” So, I usually head straight to the “about me” section and it is totally OK that you came here too. Honestly, you won’t be real impressed, and I don’t want you to be. I want you to be comfortable and I want you to stick around for many more visits. I am a busily blessed wife, mama to 4 and “Nammy” to 3. I am just your average almost 45-year-old gal who has a love/hate relationship with writing, the gift of encouragement and teaching and a sincere love and passion to come along side other women from all ages, stages and seasons of life to share strength in the struggles and cheers for the victories through our uniqueness and similarities. That is what Aprons to Iron is all about. I want to help other women, and believe right along with them, that our struggles, brokenness and failures do not determine our worth, that has already been SETTLED for us through the precious blood and unconditional love of Jesus Christ. It is in relationship with Him we find we were made to flourish and live freely with our imperfections because He has perfect covered for us! I am His masterpiece in progress and you are too! 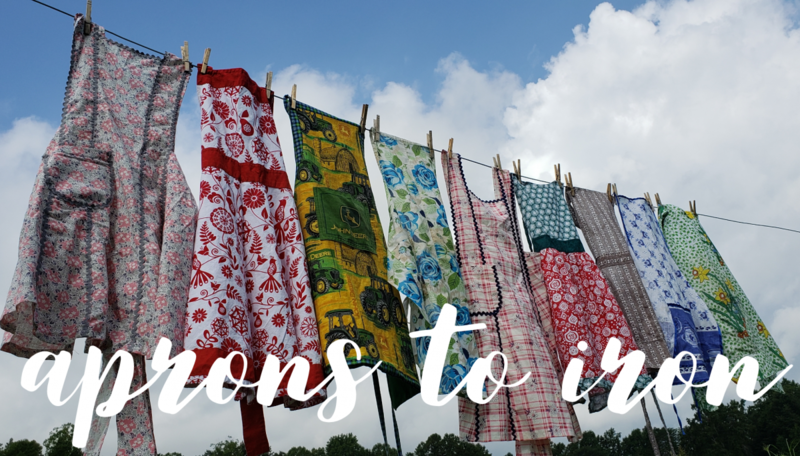 So the Aprons to Iron front porch is the perfect place where it is OK to let go of perfect! At home, in the “boondocks”, one of my most favorite spots, is in a favorite chair on my front porch, with a cup of coffee. I wished I could have you all there with me, but I hope you will keep joining me here on my virtual front porch. Come as your are please, because we don’t do fancy here on the front porch but we do do friendly 😉 I look forward to many more visits…I have a favorite chair waiting here for you too!